Firm aluminum base, three knife blades, dual speed, chip ejection mechanism. While woodworking getting the desired thickness of the wooden planes or getting a perfect surface to work with is always on top of the list. Unless you use a reliable and efficient thickness planer, woodworking might feel like a Herculean task. Here enters the DEWALT DW735R! Portable yet solid and robust, this 13 inch thickness planer has a powerful 10,000 rpm motor to make your work a piece of cake. Delivering 96 or 179 cuts per inch, the DEWALT DW735R has a three knives cutter head mechanism. It also has an exhaust system that ejects the wooden chips and shavings off the cutter head. Furthermore, it has an automatic lock mechanism facilitating reduced snipe movement and a perfectly visible measuring scale that shows the amount of cutting, aiding you in getting accurate results. 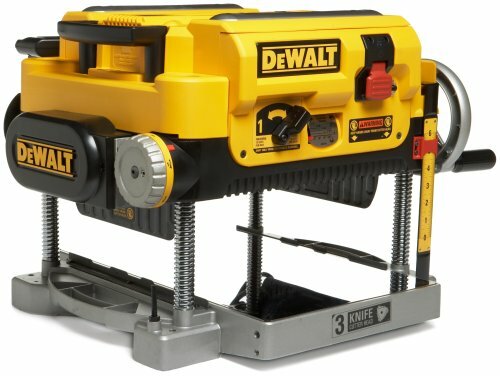 I purchased the DEWALT DW735R around 3 months back and having used it repeatedly over the past few months I can give my review now. To begin with, although claiming to be portable it is not like a small toolbox that you can carry around anywhere and everywhere. What it means is that it does not need to be fixed to the ground or some other surface for usage. One can shift it from one place to another, but since it weighs almost 100 pounds, you might need a cart or wheeler trolley to make the shifting. Once it has been positioned, next comes the usage. Using it is as simple as you can imagine. The three knives cutter head mechanism and the dual speed gear box assists in arriving at either 96 cuts per inch or 179 cuts per inch, depending on the setting that one chooses. Also, the knife blades can be changed without much trouble. The DEWALT DW735R has a material removal gauge in the front, indicating the amount of material that will be discarded as the wooden board is inserted into the planer. Further, it is accompanied with a scale that measures the exact amount of cutting in turn generating accurate results. Another top notch feature is the chip ejection system, which works through a fan. Even though it might not be a substitute for a dust-collector, nevertheless it does the job quite well. In short, you do not have to sweat it out cleaning the mess after using it. The best part about DEWALT DW735R is that it gives accurate results and the depths of cuts are next to perfection. The finishing of the woods is also very smooth, no matter how rough boards you insert. Setting it up and using it takes less than 15 minutes, especially if you properly follow the instructions given in the user manual. It is highly recommended to purchase infeed and outfeed tables for maximizing utility and making the work easier. The cutting blades are easy to remove; hence I sent the blades for a cryogenic treatment so that the longevity of blades increases. However, what is a rose without thorns! Likewise, everything about DEWALT DW735R sounds perfect until I tell you about the shipment. This is one area where the DEWALT DW735R loses points. When I received the package it was not adequately packed with protective layers. Consequently, some of the plastic parts had broken and were inside the box. Disappointed, I called customer care and, here comes the good part – all the broken parts were replaced and shipped absolutely free of cost! Another downside is that the company offers a warranty of only one year. But, overall DEWALT DW735R is perfect for the not-so-professional woodworkers. The DEWALT DW735R is the ideal way of attaining best results at woodworking. If you are new to woodworking and intending to buy your first thickness planer the DEWALT DW735R should be your choice. 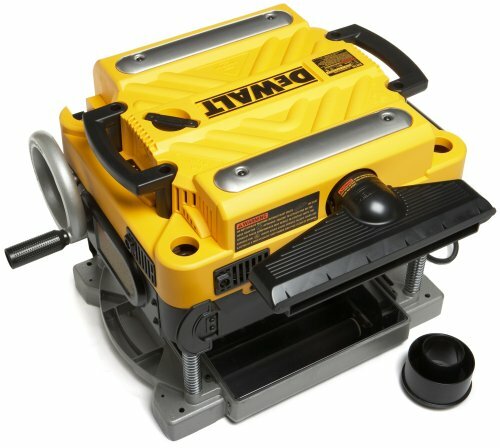 Loaded with features like a powerful 13amp 10,000rpm motor, three knives cutter head system operated by a two speed mechanism, chip ejection system, a measuring scale, material removal gauge, automatic carriage lock reducing snipe movement, this 13 inch planer gives perfects results and smooth finish to all your wooden boards. Plus, it is user-friendly. Where is the best place to buy the DeWalt DW735R hand planner? In our opinion, the best price offered online on the DeWalt DW735R hand planner is at Amazon.com. Moreover, they provide free shipping round the year. To buy this planer check out Amazon. Pros: Solidly built, stable and firm aluminum base, three knife blades, dual speed, chip ejection mechanism. Cons: A bit on the louder side as compared to other planers.